Courage the Turkey was the lucky recipient of the 2009 Pardon. Later Wednesday, Obama and his family were delivering two turkeys less fortunate than Apple and Cider to Martha’s Table, a local charity that feeds the hungry and provides other community services. 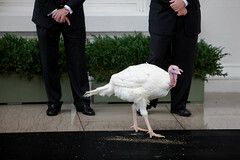 A Pennsylvania turkey farm donated the birds. The Obamas visited the charity last year, also on Thanksgiving eve, and helped hand out frozen turkeys, stuffing and other fixings to people standing in line.